For those who have been to my parents house and met the zoo that my mother calls her cats, I have sad news. On Friday mom had to have Fraiser put down. 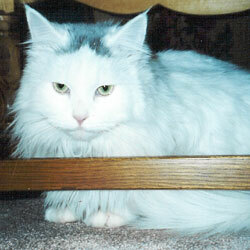 He was the giant white cat with more personality than most humans I know. Fraiser had Feline Leukemia, unbeknownst to us; that combined with fluid around his heart made him rather sick at the end of last week. My mom and Fraiser had a special bond and she has had a difficult time dealing with his loss. I think I’m still in denial a bit, since I haven’t been home yet. But I know that he’s at peace now and is probably up in pet heaven with Rikki, causing trouble and enjoying nice juicy steaks.